Drone software maker Hangar Technology wants to automate and manage drones for its enterprise customers throughout the US. To do that, it will take advantage of Vapor IO’s edge data centers that are being built nationwide. Vapor is installing its micro data centers next to cell towers owned by its investor Crown Castle, which owns 40,000 cell towers and 60,000 miles of metro fiber in the US. Hangar plans to install its drone software at each edge data center location as Vapor expands. Hangar’s customers, which include construction companies and government agencies, currently use the company’s software to manage their drones and take detailed images of construction sites and infrastructure. Through machine learning, Hangar’s software analyzes the images and spots defects and other potential problems and alerts the customers. Drone software maker Hangar Technology wants to automate and manage drones for its enterprise customers throughout the US. To do that, it will take advantage of Vapor IO’s edge data centers that are being built nationwide, the two companies announced Tuesday. Vapor, an Austin-based data center startup, recently embarked on its plans to build an edge data center colocation business by building micro data centers at cell towers across the country and offering them for lease. Vapor is deploying its first edge data center in Chicago and plans to expand to eight additional cities by the end of the year, the company’s CEO and founder Cole Crawford said. Hangar, also an Austin-based startup, plans to install its drone software at each edge data center location as Vapor expands. Hangar’s customers, which include construction companies and government agencies, currently use the company’s software to manage their drones and take detailed images of construction sites and infrastructure. Through machine learning, Hangar’s software analyzes the images and spots defects and other potential problems and alerts the customers. Today, regulations require employees to individually oversee each drone. But Hangar expects regulations to change and allow for drone automation, at which point the partnership with Vapor will allow it to provide clients with much faster data analytics, Hangar CEO Jeff DeCoux said. For example, instead of a construction employee taking the drone back to an office to upload the data, which could take up to four hours, the drone can automatically upload it to a Vapor data center nearby in 20 minutes or so, he said. Automated vehicles, including drones and cars, is one of many applications expected to drive demand for edge data centers, which ensure fast performance because data storage and computing power are located closer to users. Industry analysts say Vapor and Hangar’s announcement is significant. Vapor is a forward-thinking, innovative company that’s currently slightly ahead of the curve with its edge data centers, Rhonda Ascierto, research director of data centers and critical infrastructure at 451 Research, said. Vapor is installing its micro data centers next to cell towers owned by its investor Crown Castle, which owns 40,000 cell towers and 60,000 miles of metro fiber in the US, Crawford said. 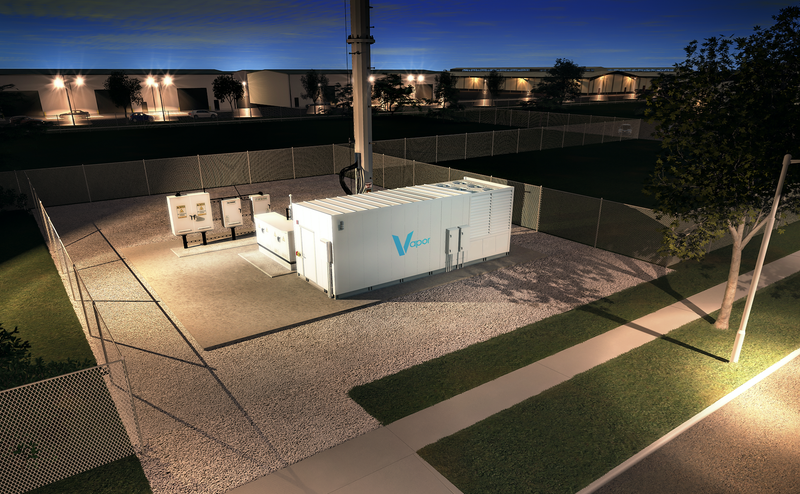 Each of its micro data centers, called Vapor Edge Modules, is shaped like a standard shipping container. Inside is a cylindrical pod that provides six high-density IT racks that provide up to 150kW of IT power capacity total. Through its Vapor Kinetic Edge architecture, Vapor uses central management and orchestration software to connect at least three micro data centers in each city or region so they run as a single highly redundant virtual data center. In the future, Hangar plans to store drones at each edge computing location. Initially, it will be able to process data on the edge. In the future, a construction worker using a virtual reality headset will be able to see a building’s 3D architectural designs overlaid on top of current images of the construction site taken by a drone and compare the two to make sure a building is being constructed correctly, DeCoux said. “You can take the data right out of the drone in real-time, compare it with the building information model which they are building to, and show how the two correlate with each other; and if they have an issue, it identifies it and allows them to address it,” he said. Other future technologies include “precision navigation,” which will more accurately pinpoint a drone’s location, and “micro weather” technology by tracking weather in the immediate vicinity of a drone, DeCoux said. For example, if it’s too windy, customers can ground the drones until the weather improves.